Local tradition states that the River Bure exited to the sea North of the historic town centre, through an area called Grubb’s Haven (Nashe, 1985, 385, Manship, 1854, 11). 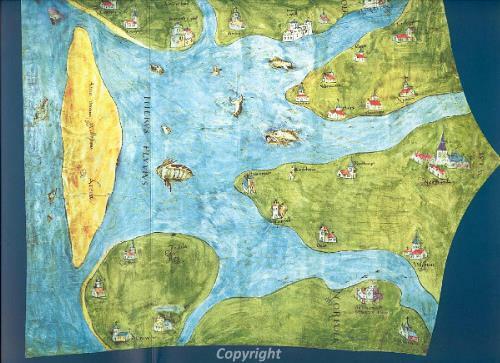 One Elizabethan cartographer (allegedly Thomas Damet) recorded a view of Yarmouth “Anno Domina Millesimo” (in the Year 1000), showing the Yarmouth sand spit as an island, with clear water to the north and south, and clear water inside the estuary. (See Great Yarmouth: Maps for more information on this and other maps of Great Yarmouth). Aerial photographic and environmental evidence suggest that in fact Breydon Water looked fairly similar to today (Coles and Funnell, 1981), and there is no physical evidence for a northern mouth of the Bure. However, there is some circumstantial evidence: Thomas Nashe (writing in 1599), records that “some visible apparent tokens remain of a haven” (Nashe, 1985, 385), while Manship (1619) records that “many Hundred Years past it hath dammed up the Mouth of the river or Channel wch passed forth on the North said of Yermouth” (Manship, 1854, 11). Interestingly, Manship records that Sir Robert Paston levelled the dunes on the site of Grubb’s Haven, for the visit of Queen Elizabeth in 1578 (q.v. Nashe, in 1599). Grubb’s Haven is reputed to lie with its centreline ¼ mile north of the Midsands Cross, and was reputed to be the northernmost boundary of Yarmouth (Rye, 1962). Certainly the ground to the North of the cross was the subject of a number of court cases, from 1299 to 1523, but the majority of these refer to cattle grazing (the first, in 1299 refers to “goods and chattels to the value of 40l” and the last to the wreck of the Admiral Sluys, in 1522, presumably on the foreshore of the disputed territory) (Rye, 1962). The position of the Northwest Tower suggests that the Bure had run its present course for some time before the building of the Town Walls. This section of walls was probably started around 1321 (Carter, 1980, 303). If the Bure had recently (i.e. within living memory) shifted to its present course from one exiting directly to the sea, it is unlikely that the town of Yarmouth would run the wall up to it as a permanent structure. It is more likely that the Bure had shifted long before the grant of murage in 1261, and Grubb's Haven remained as a relic place name. To the south of Great Yarmouth, the river Yare exited between Corton and Lowestoft, about four miles south of its current position. The river mouth began to visibly silt up in 1337, and was impassable by 1347. A new haven was cut at Corton, in 1347. The new haven was frequently blocked, and became permanently impassable around 1375. A new, second haven was cut in 1393 "opposite the horse ferry". Swinden records the location as being "by the old Trench, in a line from the North end of Gorleston or Southtown, over the Denes, the place where the foot ferry is now used" (Swinden, 1772, 377). Ecclestone equates this with the location of the Lower Ferry (NGR 652622 305500 - TG 5262 0550), and suggests that works for the power station may have encountered physical evidence of this (Ecclestone, 1959, 94). however, the Lower Ferry is approximately 500m north of the old power station, and so it is unlikely that the power station works represent the remains of the second haven. The second haven became blocked by 1408, and was replaced by the third haven, at Newton Cross, between Gorleston and Hopton. The third haven was expensive to maintain, and was replaced by the fourth haven in 1508. The location of the fourth haven is unknown, except that it was closer to the town than the third haven. The fourth haven was, in turn, replaced by the fifth haven, in 1528. The fifth haven was built "very near if not in the very place, where now it hath issue" (Manship, 1854, 80). The fifth haven silted up within 20 years, and was replaced by the sixth haven, in 1548 (which was paid for by the selling of church plate and vestments). The sixth haven was located 400m (1/4 mile) south of the South Gate, but this entrance was never really completed, and the haven was totally blocked by 1557. The seventh (current) haven was begun in 1559, and completed in 1567.